When building arrows for competitive archery or bowhunting, the quality of your fletchings is one of the most important factors. 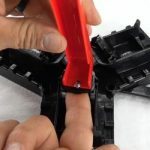 You want to choose a quality fletching, a glue that won’t fail, and a fletching jig that will lay the fletchings consistently, accurately, and in a timely manner. 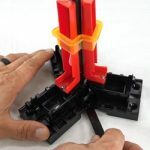 In this review we are going to take a look at a fletching jig that is not only easy on the budget, but by design, allows 3 vanes to be fletched at the same time, the Bohning Triple Tower Fletching Jig. Bohning really knocked it out of the park with this easy to use and fast fletching jig. The Bohning Triple Tower Fletching Jig utilizes a brilliantly designed base, that delivers three glued vanes to the arrow shaft with the pull of a lever. 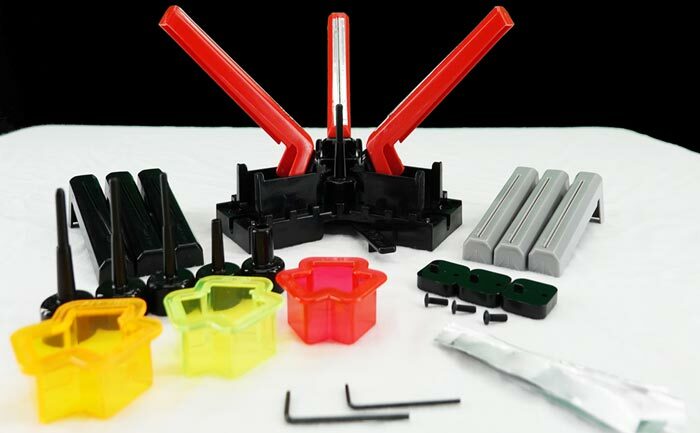 This fletching jig comes with options also. You can choose from straight fletching, 1° right offset fletching, or a 3° right helical fletching. You can also set the Bohning Triple Tower Fletching Jig to lay the fletchings at two different distances from the nock depending on what you prefer. To ensure proper adhesion, the Bohning Triple Tower Fletching Jig also utilizes tapered vane arms that work wonderfully with a tower ring system. The tower ring system ensures that even pressure is applied to each vane while the glue initially sets. Although it has an awesome design, this unit comes disassembled, so let’s dive in to the assembly process. Locate the 8/32 screw, tension lever, base, and centerpost that fits the arrow you are going to fletch. With the tab of the tension lever facing down, center it under the base. With the lever arm’s center hole and the base’s center hole aligned, insert the 8/32 screw. On the top side of the jig, you will now see the threads of the 8/32 screw. While manually moving the vane arm slides out of the way, take your center post and thread it onto the 8/32 screw until it is snug. Installation of the tension lever and center post is now complete. 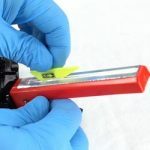 To apply the clamp release tape to the vane arms, all you have to do is peel the metallic self adhesive strip from its backing and center it on on the vane arm’s center vane slot cut-out. 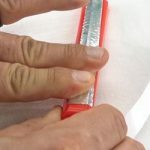 Once applied, flatten the tape down with your finger and cut out the vane slot with either your fingernail or a knife. Repeat the process for every vane arm that you plan on using. To install the vane arms, locate the (3) 6/32 x 1/4″ screws, (3) 6/32 nuts, and the (3) vane arms that you are going to use. With the nut seated on the tip of your index finger, slide it under the vane arm slide and up into the hexagonal recessed cavity directly under the screw hole.With your finger still supporting the nut, start threading one of the 6/32 x 1/4 screws into the nut until it catches the threads. While still supporting the nut with your index finger, slide the vane arm underneath the 6/32 screw head and snap the vane arm’s locking tab into the vane arm slide’s rectangular cutout. Once snapped into place, tighten the screw. Repeat this process for the 2 remaining vane arms. 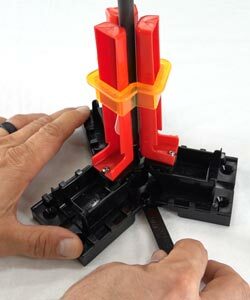 You are now ready to use the Bohning Triple Tower Fletching Jig! To use the Bohning Triple Tower Fletching Jig, first select the tower ring and centerpost that fits your arrow. If not installed already, install the centerpost into the jig. Next, insert the nock end of your arrow onto the centerpost. Once the arrow is in position, it’s time to insert the vanes into the vane arms. With the vane arms retracted and the vane arms tilted back, slide the vanes into the vane slots of the vane arms. With the vanes firmly pushed in and slid to the bottom of the vane slots, you can now apply the glue. When applying the glue, run a small bead from top to bottom of the vane’s exposed underside. Repeat this for the two remaining vanes. Once you have applied glue to the vanes, manually tilt the vane arms up against the arrow shaft. Lower the appropriate tower ring over the three vane arms. Once the vane arms are tilted against the shaft and inside the tower ring, slowly engage the tension lever to bring all three vanes against the arrow shaft. Lower the tower ring with light pressure to secure the vanes to the shaft while the glue sets. Now just count to 20 and you can remove the tower ring, pull back the vane arms, and remove your arrow. 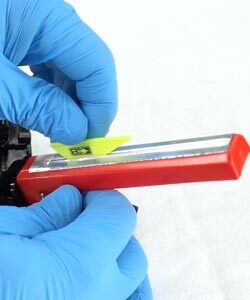 After removing your arrow its a good idea to clean off any glue that may have escaped. Done! We really like this jig. It is economically priced, made in the US, and does a quick, quality job of fletching arrows. The Bohning Triple Tower Fletching Jig, when used with the Bohning SSR shaft cleaner, Bohning vanes, and Bohning Blazer Bond glue, will give you a bonded fletching that will most likely outlast the arrow. of the glued vane may contact and stick to the arrow before the tower ring can center the vanes. That being said, how often are you going to use a 4 inch vane? 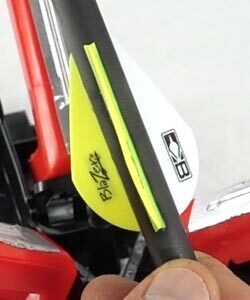 With the standard, shorter vanes, we didn’t notice any imperfections with the laid fletchings. For the majority of arrow builders, this occasional variance won’t be experienced. In conclusion, this is a great fletching jig. The Triple Tower Fletching Jig is well designed, accurate with most vanes, and does one of the quickest fletching jobs in the industry. With a price point of around $100 or less, it is of extreme value. To find out more about the Bohning Triple Tower Fletching Jig, visit http://www.bohning.com. The Bohning Triple Tower fletching jig is an extremely fast and accurate jig that is easy on the pocketbook!